Round two of the S.C.F.T.A. was different to say the least. the entry tally shot upwards of two hundred twelve with forty heat races! next day on Sunday making up for the first planned race that was rained out. 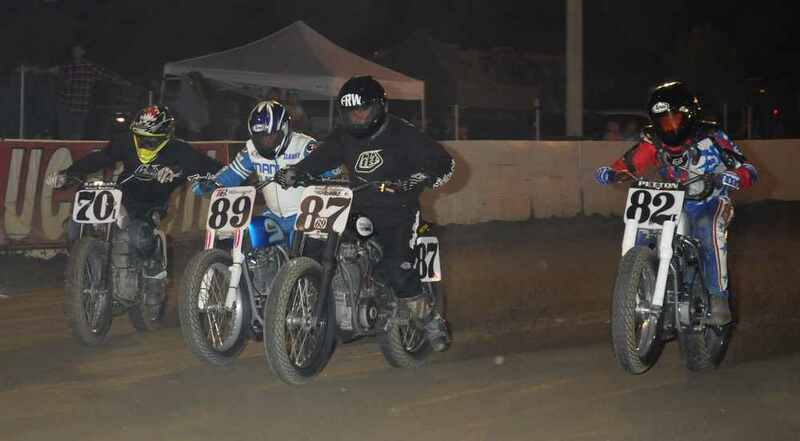 to the fact flat track is alive and doing well; at least at Perris! it didn't matter as Kolkman was still up front where he belonged! His fastest lap time was 14.70 seconds, the fastest of the entire night! second consistent laps were solid enough for the win. #151 Billy Katkov, #44 Hayden Earwood,# 23 Justin Hanson. #87 Jeff Johnson is the force in the Bomber expert class. #89 Danny Perkins has the pace as well but slid out of contention. #26b Ken Shilling fought hard for the victory in the Senior Vet +50 Novice Main event. Rolf Greenhill, #37 Donnie Moore. #95 Tom Ferguson pretty much owns the Classic Vintage class. some vintage twins as well. #58c Jack Neeley, #86d Allan Girdler. separately, Lawson was the overall winner on the track. for the win. #57 Robert Slettler, #26 Steele Friedrich, #517 Anthony Brown. on this night he was hot! he was the only one capable of lapping in the fifteen second bracket. #45e Arnde Fox, #17D Joel Manthis, #21 Darin Dwyer. #12 Jaycee Jones is dominating the Powder Puff class. #22 Jimmy Gillen has found his race pace again. with a 15.30 second lap time! here in the heat race and the main event for the victory. His fastest lap time was 18.06 seconds! The quite power at Perris (Left to Right) Vince Graves and Freddie Edwards. Notice, Freddie has a radio! and # 420 Greg Powell. 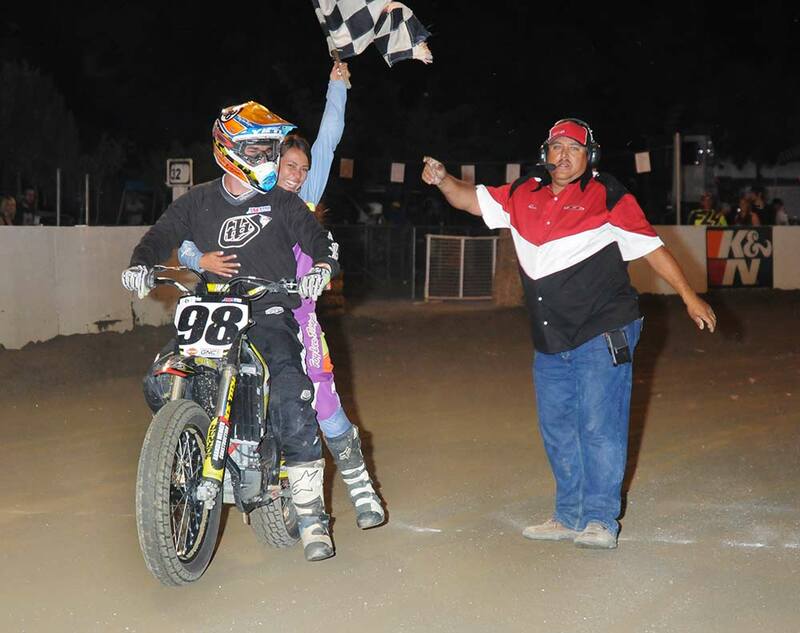 #25 Travis Horn won both the 50cc 4-stk Am. class and the 65cc-70cc Open class. #22 Ashton Carlson from Lompoc Calif.
65cc-70cc 2-stk Beg. Main Events. 4-stk Beg. field with a time of 18.68 seconds. the 4th to the stripe with a fastest lap time of 16.15 seconds. #7 Joe Jones and Thomas Summers won the Sidecar main event with a fastest lap time of 14.78 seconds! Sidecars were a new class for the S.C.F.T.A. class "C" program. They also run the oval clockwise, which is the opposite direction from the motorcycles.